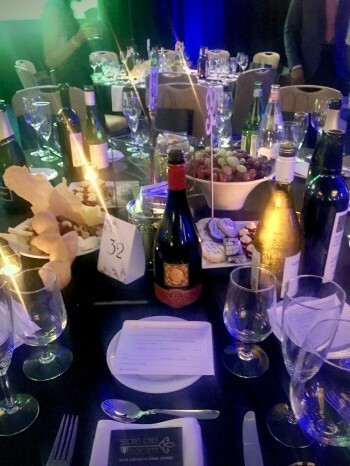 A few weeks ago, members of our Wine Council attended a Kosher wine tasting. 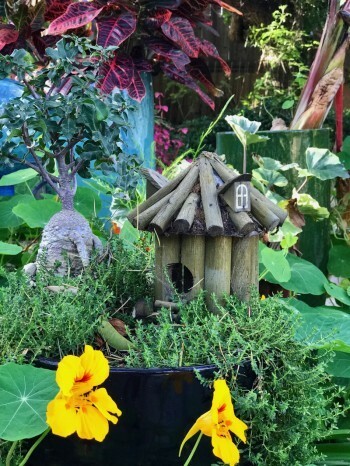 The setting was the beautiful, tropically landscaped patio belonging to wine writer, Robin Dohrn-Simpson, and her chef husband, Marc. It was a glorious Southern California day and the wine tasting with delicious food pairings was also exceptional. 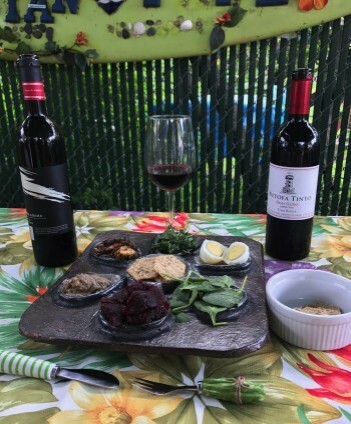 Since Israel is on the same latitude as San Diego, this could just as easily have been a spring day in the regions where the grapes for these wines were grown. Our first question was “What is Kosher wine?” We learned that in order to be certified as Kosher, wines must be produced under the supervision of Orthodox Jewish males who observe the Sabbath. During the wine-making process, Jewish laws must be observed, which means the wine-in-production must not have contact with grain or bread. It was interesting that one of our Wine Council members brought an authentic Seder plate that might typically be part of a Passover observance. The six foods that are traditionally on a Seder plate include a roasted egg; apple, nuts and spices; bitter vegetables; a vegetable dipped in salt water; bitter herbs; and shankbone. Each of these items symbolizes a different aspect of the Paschal lamb sacrificed in honor of the Seder festival. 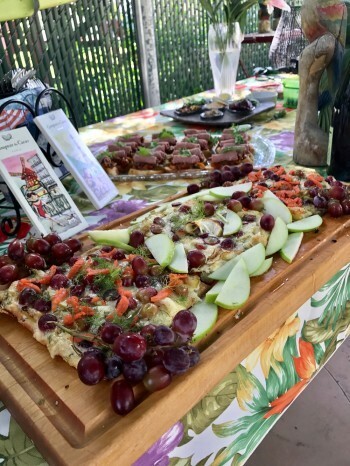 We had similar ingredients at our wine pairing and although we did not directly pair them with the wine, they added an authenticity and richness to our wine tasting experience. We were pleasantly surprised at the excellence of the following wines that we tasted, most of which are readily available in the U.S.
2014 Flam Blanc—an unoaked blend of Chardonnay and Sauvignon Blanc produced in the Judean Hills. This wine is light and zesty with flavors of grapefruit, grass and apple, making it a refreshing wine that would be perfect for a summery California day. This wine was nicely paired with a savory frittata of spinach, potatoes and leeks, which contrasted nicely with the tartness of the wine. Our wine tasters selected this wine as their favorite white wine of the day. It retails for $31. 2014 Matar by Pelter —a Sauvignon Blanc and Semillon blend. This is a crispy, fruity wine highlighted by a bouquet of grapefruit and strawberries with a rich peach and lemon taste on the palate. It also paired well with the creamy frittata, but we imagined it also complementing a light lemon or grapefruit sorbet. It retails for $33. 2014 Teperberg Essence Chardonnay—partially aged in oak, resulting in a nutty, vanilla flavor. Enhanced by a pineapple tropical nose, this wine is rich and pleasant to sip. Its fruity acidity paired so well with a creative pizza topped with grapes, apples, fennel and Alfredo sauce. It retails for $36. 2010 Carmel Winery Merlot—an elegant, fruit-forward wine from Sha’al Vineyard in Galilee, which had aged for ten months in French oak. This beautiful ruby red wine is very rich with lots of minerality, tastes of plum, and a smooth tannic finish. It was ideally paired with flavorful roast beef rolls. Our group chose this wine as the best of the afternoon’s tasting. It retails for $33. 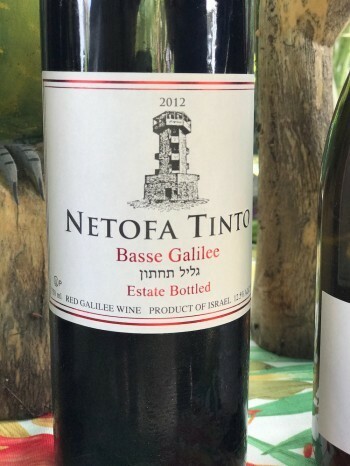 2012 Netofa Tinto Basse—a blend of Tempranillo and Tiouriga from Galilee. This deep red (almost purple) wine has dark tart cherries and tabacco on the nose with a smoky, spicy taste that is enhanced by hints of peach. The finish is long with intense tannins. This bold wine held up well when tasted with a tangy, delicious paella of Tofurkey, smoked paprika, carrots and rice. It also went well with sharp cheeses. We were impressed with the reasonable retail price of $24. 2012 Tabor Adama Shiraz—a deep purple, full-bodied wine from Galilee with touches of clove and pepper. We also tasted cedar and oak resulting from its barrel fermentation. This rich wine combined raspberry, mulberry and blackberry flavors, creating a pleasant, delicious taste that went well with baguettes toasted with an olive tapenade. The retail price is appealing at $18. Whether you are specifically looking for Kosher wines or just for really good food-pairing wines, these wines hit the spot and will go well with a wide variety of dishes. Thank you to the Royal Wine Corporation from New Jersey for providing these wonderful Kosher wines, most of which can be purchased online.